North Sandbar is good for couples who seek their own paradise away from the city or a group of friends that want to laugh and play by the beach. Stellar and serene, imagine having an island all to yourself for a day. It is located about 2 hours away from Mactan by bangka. The North Sandbar is a place where clear blue waters and white sand are abundant as far as your eyes will take you. Enjoy a day of fun and frolic by the beach with your friends. Every visitor will truly ease up once they take a dip there. 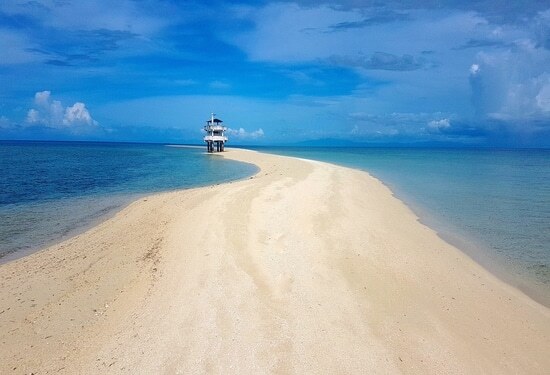 The sandbar is especially visible during the low tide but is still as enjoyable during the high tide because of the naturally beautiful and crystal clear waters. Although there are no cottages available for tourists and places to dive, the North Sandbar is a worry-free gateway to paradise. Be sure to bring enough food along with the best company to last you through your Island Hopping day..
Get your sunglasses and your coldest beverages ready and head to the North Sandbar today!